Fishing is the first thing that came to my mind when roaming Cheung Chau village, due to the abundance of little boats drifting in the harbour, and the many seafood restaurants by the shore, which of course, we had to sample for our lunch stop. The island also has some of the largest fish balls you'll ever see available, and they're delicious! Despite spotting a McDonald's and Circle K the second we stepped off the ferry, it still feels like a very peaceful, quaint little town - though nearly anything would after living in the heart of Kowloon! I also love being by the ocean, especially harbour-side places like this. We headed for what was meant to be one of the most interesting temples on the island, Pak Tai Temple, dedicated to the Taoist god of the sea. After seeing many of these sorts of small temple throughout Hong Kong, they can get a bit repetitive, but I really like the colourful detailing on the outside of this one, creating images of dragons and flowers. There is also some interesting architecture to it, with circular doorways leading to the pavilion at the back. After seeing the temple, but before stopping for lunch, we walked around the northern shore of the island, which is a very peaceful path, with the ocean on one side, and forest on the other. Like Lamma, there are no cars on Cheung Chau, so bicycles are the only means of transport passing you by. You can hire one for the day, but we opted not to, which proved to be wise later on (see below). This route also has views across to the much larger Lantau Island. We turned inland after a while, to climb the path up to the North Lookout Pavilion, the highest point on the island. The views certainly did not disappoint, and made the hike very worthwhile, and the sun chose that moment to really shine, lighting up the turquoise waters all around us. As well as Lantau, we could see Lamma Island, further in the distance to the east, and the rest of Cheung Chau to the south, though it was somewhat masked by foliage. After descending the hill and having lunch in the village, we continued our exploration by turning towards the south side of the island. The village stretches quite far, so there were plenty more shops, restaurants, and fishing boats to pass on the way, and we had ice creams while strolling in the sunshine. 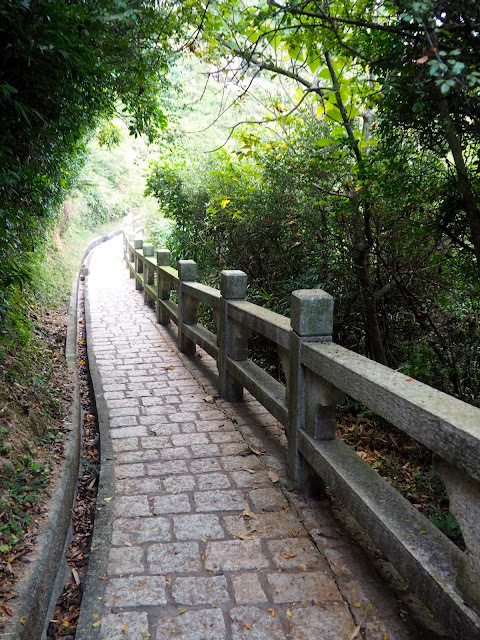 If you aren't interested in hiking, this is definitely a route worth wandering along, down Tai Hing Tai Road and on to Cheung Chau Sai Tai Road. 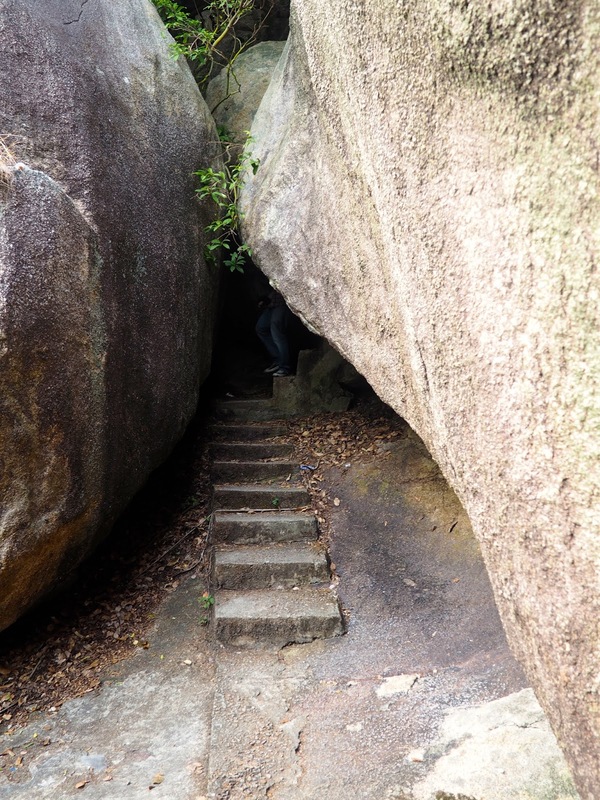 Eventually we reached the south west corner of the island, where an old pirate cave, that once belonged to Cheung Po Tsai, lies hidden in the rocks. Following the steps down to the cave, you can look inside, but as this is one of the major attractions on the island, the queue to get inside was too long for our liking, and the cave is apparently quite underwhelming anyway. Instead, we continued on the path, clambering through a rock formation (hence why it was good not to have bikes!) and heading towards the Reclining Rock. 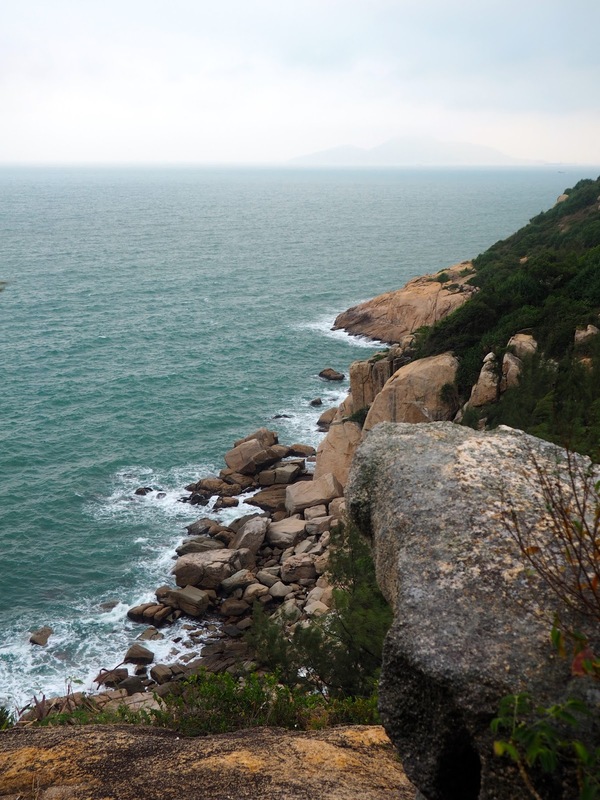 The rock itself isn't that remarkable, but this is a very pleasant area of the island, with these pretty views out to sea and Shek Kwu Chau Island, as well as views back towards the rocks where the cave is. We continued on, to explore all we could, but this would be a nice spot to relax for a while. Our path took us all the way along the south coast of the island, and took a couple of hours to get around to the east side, where the beaches are, and back to the village. There is a path the whole way, and it isn't terribly strenuous, but there are a few ups and downs as you climb over hills. Parts of the walk take you to other secluded coves and beaches, then climb back up into the hills, where the path is shaded by greenery. There are so many lovely views of rugged, rocky coastlines, and the whole thing is just so quiet compared to the bustle of the city. There are a few pavilions on the way, but nothing very remarkable, and there are options to take detours to nicer pavilions, such as Kwan Kung, and other temples, but we opted not to, having seen plenty before, and having limited time before the sunset. Eventually we reached the east side, where the path takes you on to the Mini Great Wall feature. The wall itself is a bit of a let-down after its name, but does offer ocean views all the way along, which was nice after being under the canopy for so long at that point. It also points out various rock features along the way, but we didn't think any of them really looked like what they were named after. The view of the village and Tung Wan beach was certainly worth seeing though. We made our way down to Kwun Yam Wan beach, the smaller, more secluded one, which was practically deserted while we were there, since it was around 5.30pm by then. That didn't stop us from taking a dip though, and the water wasn't as cold as expected! It got almost entirely dark then too, and we finished up our circuit by walking back through the village, where we passed this love lock feature pictured. We had considered another helping of seafood for dinner, but we were all pretty exhausted after the hiking, so just headed back to the city. It was a lovely day out though, and we will most definitely be back for a lazier day, of beach time and seafood!